While you can’t completely avoid stress, you can change how you react to it. 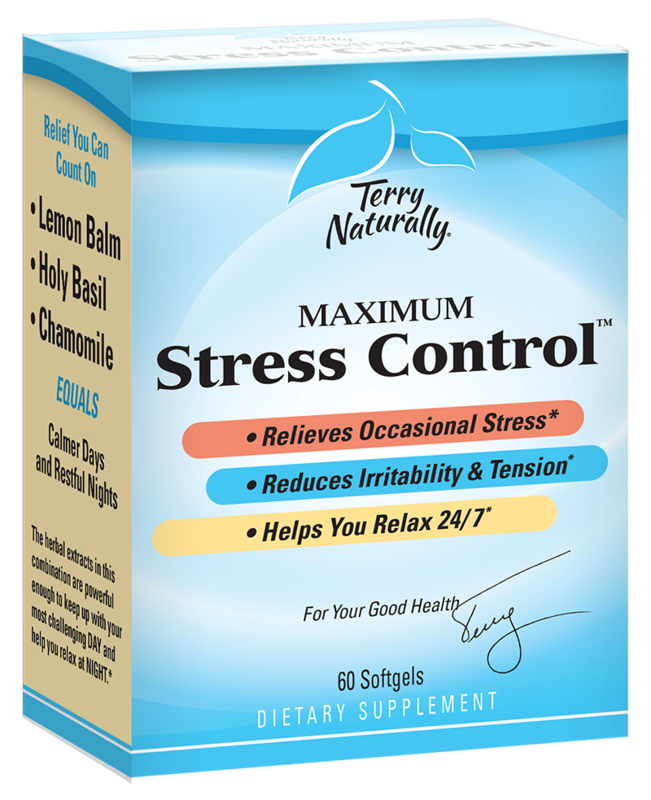 Maximum Stress Control can help. Other Ingredients:extra virgin olive oil, gelatin, glycerol, beeswax, sunflower lecithin, water, chlorophyll. No:sugar, salt, yeast, wheat, gluten, corn, soy, dairy products, artificial coloring, artificial flavoring, or artificial preservatives. Adults and children (12 & older): 1 softgel twice daily. Children (ages 6-11): 1 softgel daily. Will this product make me feel sleepy during the day? I see there is a “supercritical CO2 extract” in this formula. What does “supercritical” mean? Supercritical CO2, meaning carbon dioxide in a liquid form, is a special type of non-toxic solvent that is particularly good for extracting essential oils without damaging them or causing them to become rancid through oxidation. Supercritical CO2 extract is the preferred method for obtaining a full spectrum essential oil extract, discarding the non-essential fibrous plant material. This process is a cold extraction that uses no heat. Supercritical CO2 yields a very pure extract, with no heavy metals or potential for bacterial growth. Because it evaporates completely there is also no concern about contamination or residue left in the extracted materials. I give and grant to EuroPharma the right to use, publish, my name, and testimonial in all media and types of advertising and promotion. I agree that no advertisement or other material needs to be submitted to me for any further approval. I grant EuroPharma unrestricted, unlimited right and permission to use, reproduce, copyright, publish, publish to the Internet, and exhibit in any form and manner whatsoever, the testimonial that I now submit electronically. I further agree that EuroPharma will have the right to attribute the above statement (or statements in different words which have substantially the same meaning) to me, which is an expression of my personal expression and belief.